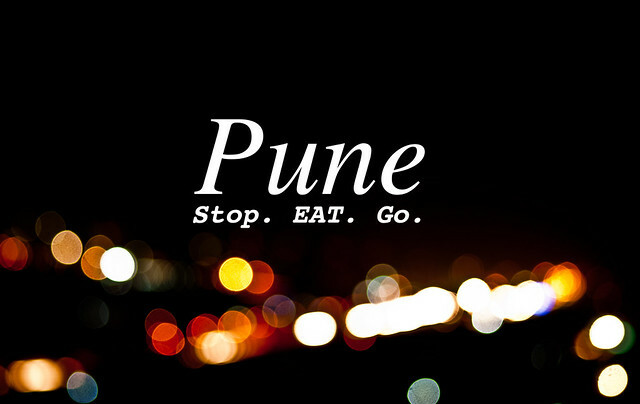 Pune, a city known for its many facets. A place which is as metropolitan as can be. That city where people like us come, make a life and only seldom leave. There is a lot in Pune to keep you hooked and I know you won’t argue when I say that the city’s food too works like a charm. Right from the road-side tapris or handcarts that serve us with our flaming hot cuttings of chai to those high end and lavish spreads of cuisine, everything is here to be liked. I’ve spent close to five years in this city, going to college and making a career for myself. In that time it has been easy to tumble along and move through the streets of Pune one full tummy at a time. 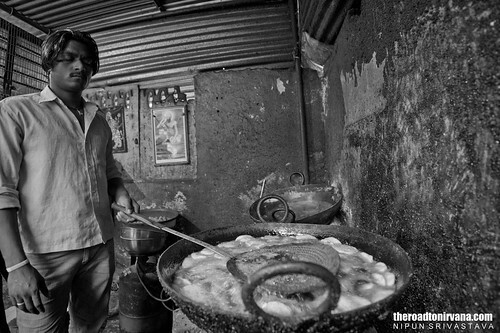 It’s been fun unearthing some real extraordinary and sometimes mighty different foods in Pune. The city is home to some killer street food. For anyone who values cuisine, the scene here is set. Here are three special things that we will show to you in this article. Three completely different kinds of grub. A three stop vegetarian foodie trip through Pune. Heads up: Special thanks to Yogesh Shinde for being a part of The Nirvana Team this time round! 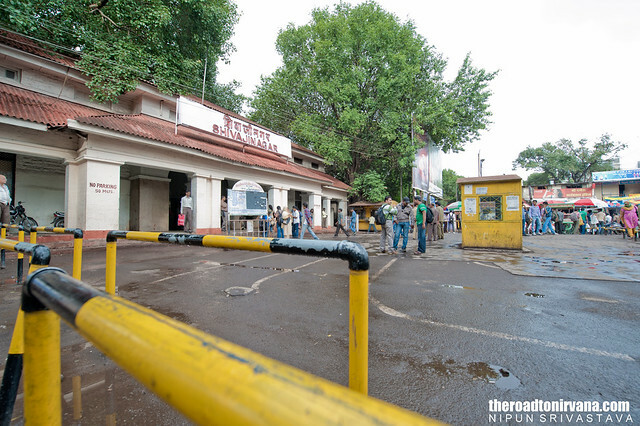 Since the early 1900s the Shivajinagar railway head has been an important station for travellers coming to and heading out from Pune. Now a days, it is jam packed with all things travel. Right from passenger trains and locals fetching and delivering the masses to and from their daily destinations to big red busses crowding the road in front of this old railway station. The reason for this organized rush hour mayhem is the people of the city, their travel and their journey through daily life. Something as routine as the thousands of people who pass through the gates of this station is the Jhatka Bhel stall here. Tucked away in the lower right-hand corner, just outside the entrance, this stall is small, quiet and to the point. Since 1951, this oddly named bhel stall stands here. 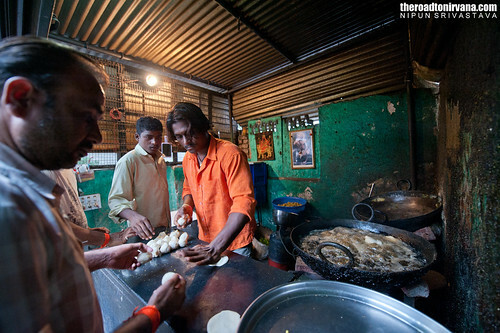 Feeding travellers with just one simple concoction of basic Indian ingredients. 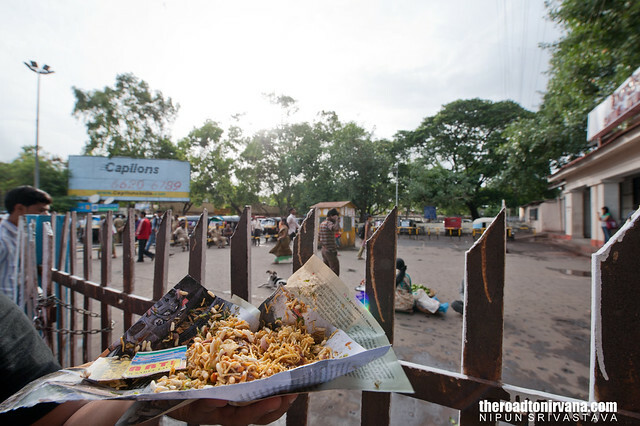 Bhel Puri, in this part of the country, is as old as tradition itself. It is a sweet/savoury melange of puffed rice, fresh cut onions and tomatoes, coriander, spices and tamarind chutney. On the go, this quick fix dish makes for an apt fuel. For those of us who value quality and quantity, a portion of Jhatka Bhel here at the Shivajinagar station is just perfect. What makes this particular Bhel Puri even more special is the story behind its peculiar name and its existence altogether. 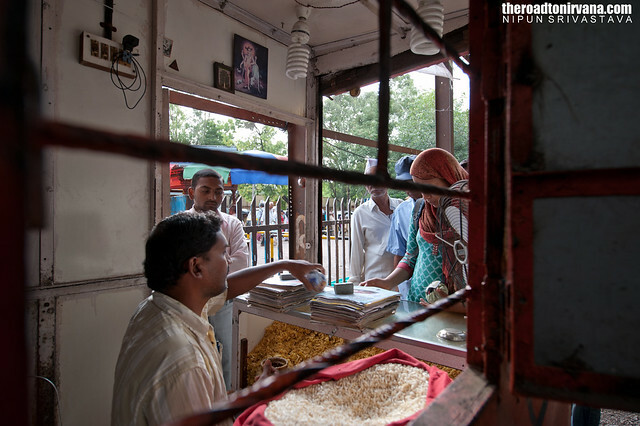 The year was 1951 when a man named Yedunad Prasad Yadav started hawking at the Shivajinagar railway station. Over time he got himself a rented cubicle on the right hand side of the station’s entrance. That ordinary looking cubicle still stands today, now run by Yedunad’s grandson – Radhesham Yadav. 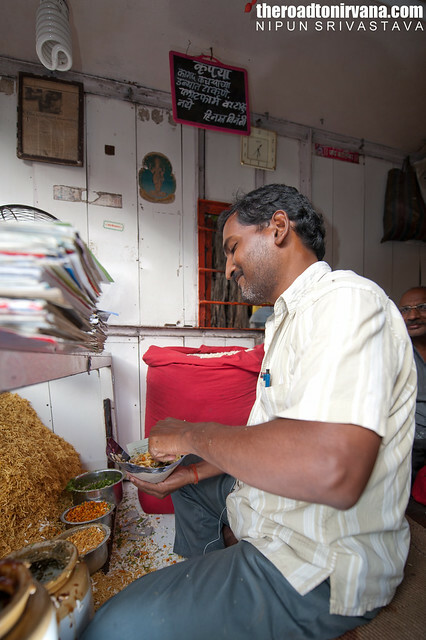 More than half a century of Bhel selling prowess has gotten the Jhatka Bhel its share of dedicated patrons. It was originally known as Bhel Puri. But Yedunad Yadav had a unique style of putting all the ingredients together. As he went about making a portion of the popular Indian Chaat, Yadav jolted his head to one side in a peculiar albeit amusing way. Those frequent head bangs lent their name to his particular Bhel concoction – Jhatka Bhel. Back to the future, Radhesham who has taken his grandfather’s place in the shop since 1994 doesn’t headbang while making your bhel but the original taste remains and so does the name. 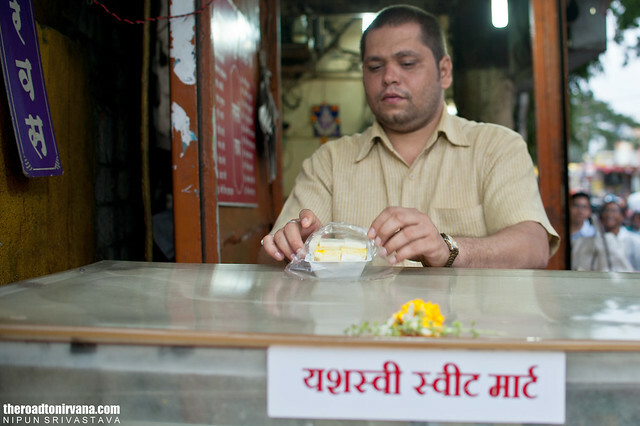 Radhesham goes about selling the bhel in a nonchalant and almost stoic way. Talking only while taking orders and delivering over the counter. Quite the contrast, we would say. Radhesham, doing what he does best! G.S. 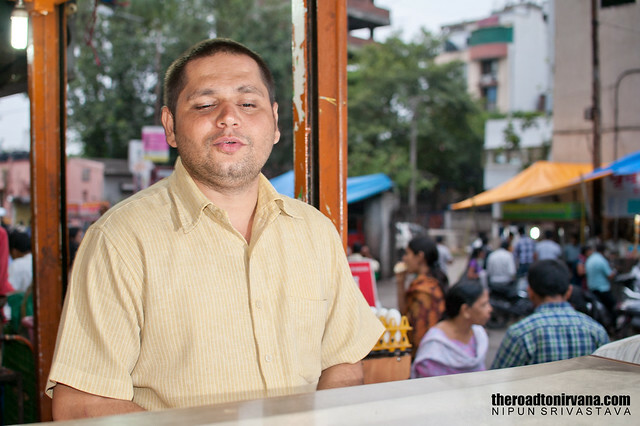 Gaikwad, a regular at the Jatka Bhel stall says that the ‘good chutney’ and ‘kadak crispy’ rice puffs have had him reaching for his bit of bhel since he was a kid! That’s pretty much the story with most patrons at this stall, they swear by Radhesham’s preparation. 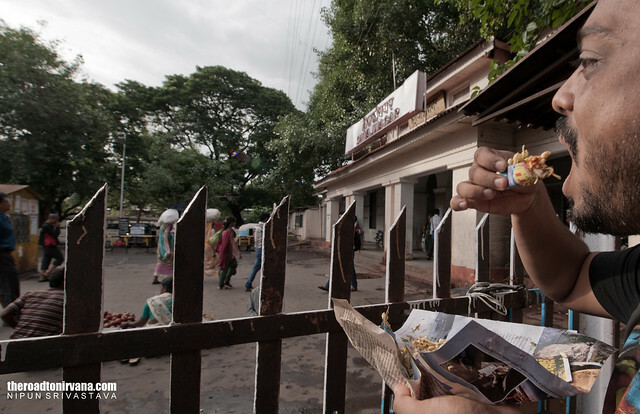 So much so that sometimes people miss their trains just so that they can eat the Jhatka Bhel! 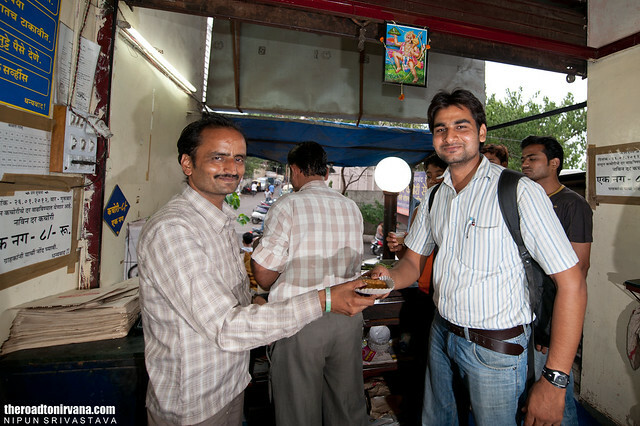 Gaikwad and other patrons line up for their share. When here, one can’t help but notice the attention to hygiene and cleanliness. Radhesham and his customers make sure they do not litter. There are no utensils used at all, except the bhel mixing spatula of course. Sign in Marathi: Do not litter the platform, use dustbins. The snack is served in a folded piece of broadsheet and the spoons are makeshift too. Like little shovels, patrons use the thin cardboard pieces as spoons. This would be heaven for eco-mentalists and health-freaks! At INR 15 a portion, a tummy-full of ‘get going grub’ is in everybody’s reach. It’s an explosion of flavours, the Jhatka Bhel. Much like everything else that’s Indian. The Nirvana Verdict: We rate the Jhatka Bhel at a 3.5 on 5. Not just any Kachauri, this. Selling like hot cakes for the past 56 years in the small town of Shegaon, the Shegaon-ki-kachauri has made its way to Pune. Much loved here too, we might add! Scores of people throng this roadside shop just off J.M. Road everyday. At eight bucks a piece, these little pockets of fried pastry pack a good punch. Piping hot, deep fried, spicy and compact – the perfect food for a city goer. 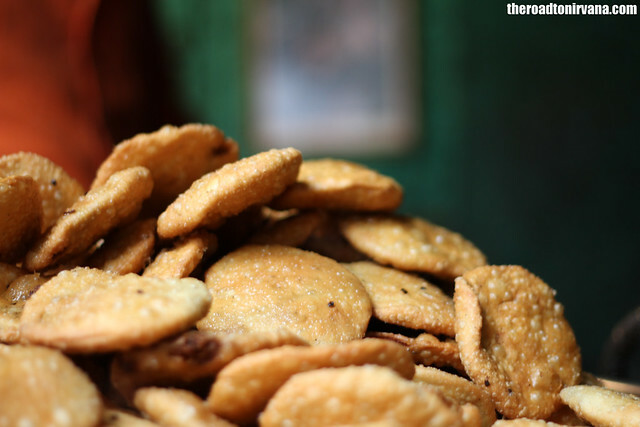 The Kachauri is a popular Indian snack. 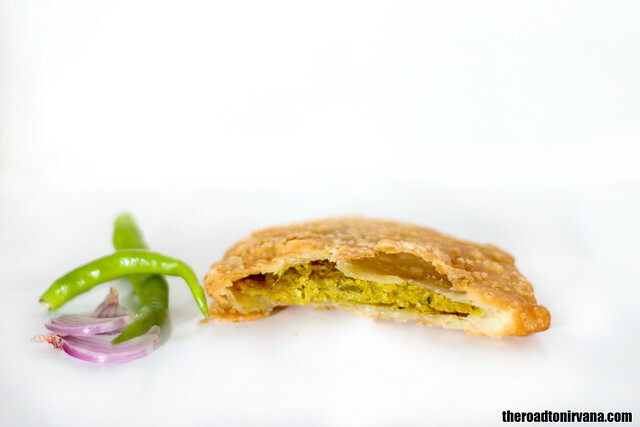 It’s a round, deep fried and savoury pastry filled with a spicy stuffing. It’s a real rage all year round in Indian households and each house has their own recipe for the filling. The Kachauri even boasts of a good shelf life and hence is even more popular. Shashikant Sharma, manager of the Kachauri outlet’s J.M. Road shop told us that he’s been selling the snack for over five years in Pune. He says that the Kachauris have a cult following here. Not just Pune, Sharma tells the Nirvana team that apart from Shegaon and Pune, the snack sells well in places like Nagpur, Amravati and even Mumbai. He’s mighty proud of his product. A camera-shy Shashikant with his Kachauris. “Nowhere in Pune will you find the taste which you’ll get in our Kachauris” Sharma boasts. We agree! Mehul Shah, who works with Just Dial stays nearby and swears by the Shegaon Kachauri. He says he’s eaten many a Kachauri but none match the taste which he finds here. Shah is a regular at the joint. Mehul Shah, getting his grub. Freshly fried right next to you, the piercing aroma adds that much more zing to a brilliant snacking experience. Fair warning, this snack is highly addictive when served hot and is very high in calories! Watch it! One concern that we did have was the hygiene of the cooking environment. It could put some people off. This outlet is open throughout the day, on all days. The Nirvana Verdict: We rate the Shegaon ki Kachauri at a 4 on 5. It’s that good! 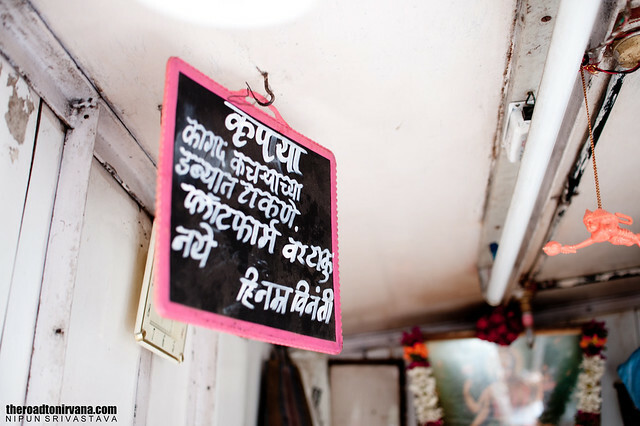 Travelling through the streets of Pune, it’s not uncommon to come across something one hasn’t experienced before. Look what we found for dessert! Kharwas is not your ordinary dessert. 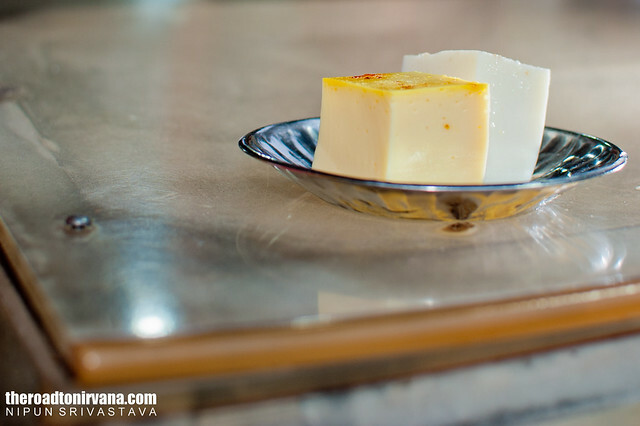 It is a sweet meat made out of a cow’s first milk, just after it gives birth. The texture is like a smooth cheesecake and the taste may need to be acquired for some. Saffron and Cardamom flavoured Kharwas. Very high in protein, this unique sweet dish is known to increase body heat. Don’t be going anywhere close if you’ve just discovered you’re pregnant. Known as Barri in the Marwadi language, Kharwas is popular amongst Puneites in flavors such as Kesar (saffron), Elaichi (cardamom) and pistachio. Describing it as a unique and special sweet meat, owner of the corner shop Mr. Krishna Pardeshi tells us that he has been selling it at this very spot for over ten years. 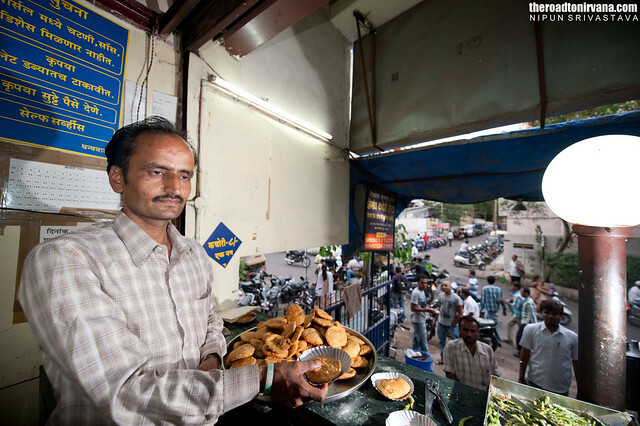 His Kharwas shop – Yashaswi Sweet Mart, is so well tucked into the street corner that it’s hard not to miss. Just off J.M. Road, on the road going towards the famous ‘Z’ bridge, his shop can be seen on the left. There’s no drama here. Just a humble Mr. Pardeshi serving up Kharwas by the plate. When the inquisitive Nirvana team asked Mr. Pardeshi how he procures so much ‘first milk’ everyday, he smiles. He then goes on to tell us that he contacts owners of buffaloes and cows all over the city and then gets them to sell the special milk to him. Quite a logistical feat we think! The Kharwas here is fresh, sweet and at 18 INR a portion it’s quite a departure from the now common in Pune gelato/mithai experience. Worth a shot for sure! The Yashaswi Sweets shop is open from 5pm to 10pm, all through the week. The Nirvana Verdict: We give this unique sweet a 3 on 5. So those are our three not-so-run-of-the-mill (vegetarian) eats from the city of Pune. Do feel free to comment and leave suggestions for new and interesting foodie destinations. The Nirvana Team is always ready for good grub! This entry was posted on July 17, 2012 by Nipun Srivastava. It was filed under Food and was tagged with city, dessert, eating, food, grub, jhatka bhel, kachauri, kachori, kharwas, nikon, Nipun Srivastava, photography, Pune, roads, shegaon ki kachauri, sweet, Travel, yogesh shinde.